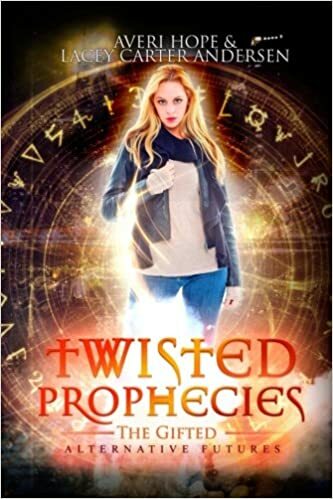 Book 4 in the Alternative Futures, Twisted Prophecies: The Gifted by Averi Hope and Lacy Carter Andersen. While like the one before this does not occur in the same future, but a different one that still involves earth and humans as its focal point. Twenty years ago an alien space ship crash landed on earth sending out a virus that infected certain people driving many of them to death. Kaci has no choice but to drive everyone away in order to keep order in her home to allow the virus in her head to have some control. The government has issued a draft for women around the world that will be required to fight the incoming alien invasion. Women are selected if they can pass a test. When the military comes for Kaci’s sister, she tells them to take her instead as her sister already had served the government and lost her leg in that war. Kaci passes the test and gets to go into training to be come pilot in the upcoming conflict. Seer is on a ship in space heading towards the a planet where he is tasked with finding brides for the other men of his race. Years before a virus killed off most of the women and now the species requires women from similar species in order to procreate. Seer is unable to shift so that makes him a Tier Two and uneligible for a mate of his own. But Seer has the ability to see the future and in that future he sees a beautiful woman with bright blue eyes that he knows is meant to be his mate. What will happen with the invasion of earth by this unknown alien force? Can Kaci come to terms with her illness or is there a way for it to be cured? Check out Twisted Prophecies here.